I normally don’t comment on DC covers, because I so often find them meaningless. Whatever the cover image might be, it rarely has much to do with the content within. Usually it’s a pin-up, or a foreshadowing of next issue’s events. 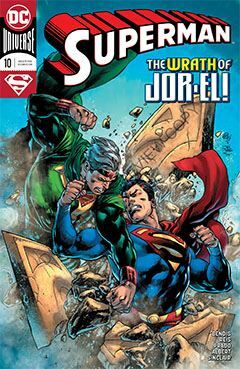 In this case, it’s downright misleading, because there are no fisticuffs between Superman and Jor-El. Spoiler? No, just truth in advertising. I would appreciate it if DC Comics would re-think its overall cover strategy. Not only in how the cover relates to the contents, but do away with the variants altogether. On special occasions, such as last month’s Detective Comics #1,000, sure, but month-to-month, it has little to no merit. Mostly, it just adds an unnecessary expense to the production of any given issue. But as for this month’s Superman #10, answers are forthcoming, though it’s mostly a finale of the flashback from Superman #7-9. While some questions are answered, new ones come up, and the truth behind Jor-El remains elusive. I hope that’s not a plot point that drags on too much longer. I wish DC could say definitively if this being truly is or is not the Jor-El. As always, the art team of Ivan Reis, Brandon Peterson, Joe Prado and Oclair Albert are spot on. Things seem to weaken slightly toward the end of the chapter, but given what lies ahead, I can live with it.